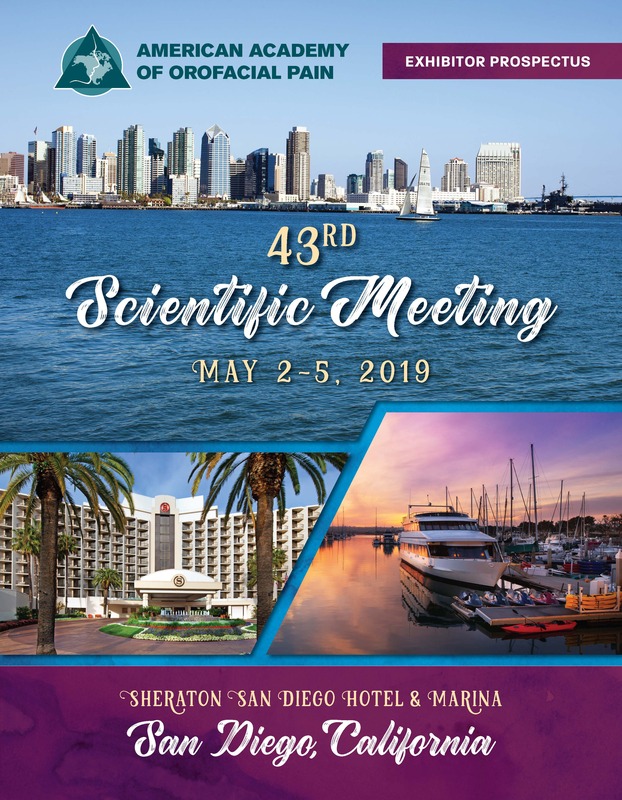 The American Academy of Orofacial Pain is responsible for the content and quality of all continuing education activities at this meeting. The scientific nature of this meeting requires that it be free of any commercial influence. Faculty/speakers are prohibited from promoting commercial products during presentations and the educational facilities must be free of any commercial literature of endorsements. 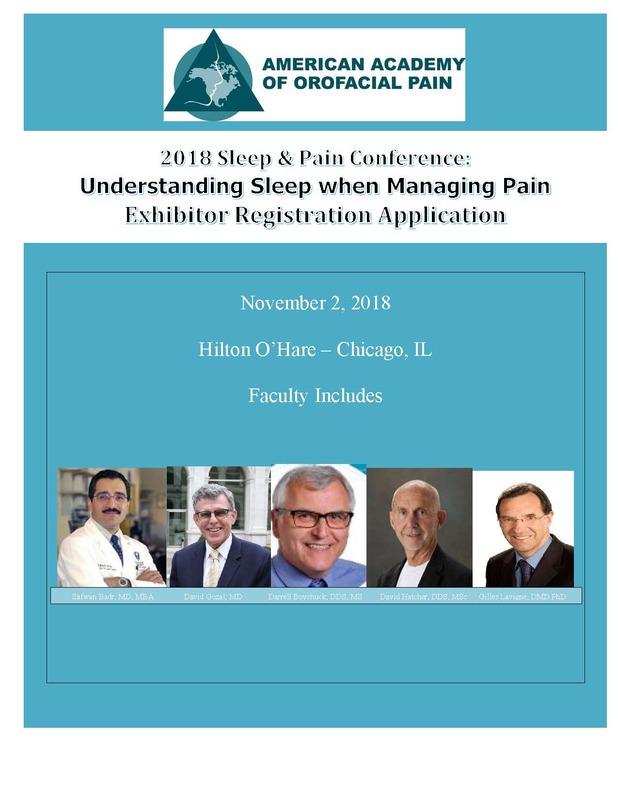 EXHIBIT HALL SHOW MANAGEMENT is by the American Academy of Orofacial Pain, 174 S. New York Rd., POB 478, Oceanville , NJ 08231 USA 609-504-1311, Fax 609-573-5064, Email admin@aaop.org. Convention Center or Hotel Facility is printed on the Exhibitor Prospectus front cover. ELIGIBLE EXHIBITS: SHOW MANAGEMENT reserves the right to determine the eligibility of any Company or Product to exhibit in the Show and further reserves the right to reject any application and/or limit space assigned to any one Company. INSTALLATION, SHOW AND DISMANTLEMENT: Exhibitor agrees to comply with assigned installation, show and dismantle days and hours as outlined in the Exhibitor Prospectus. Exhibits may not be removed from the Facility until final closing of the show unless special permission is obtained in writing in advance from SHOW MANAGEMENT. Exhibits must be removed from the hotel/facility when specified in the Exhibitor Prospectus. Any displays or materials left in booths, without instructions will be discarded. CANCELLATION, WITHDRAWAL OR REDUCTIONS IN SPACE: Cancellation or reductions in space and refund is subject to the following conditions: Exhibitors shall give written notice of cancellation. If written notice is received more than 60 days prior to show opening, total money less a 50% cancellation fee will be refunded to Exhibitor if the booth is not resold. In the event the booth is resold a full refund will be issued less $100. No refunds will be allowed for any cancellation less than 60 days prior to the opening of the Show and SHOW MANAGEMENT reserves the right to re-sell space. Booth assignments will be made according to the procedures outlined on the contract for space. Exhibitors may not sublease the booth or any equipment provided by SHOW MANAGEMENT, nor shall Exhibitor assign this lease in whole or in part without written approval by SHOW MANAGEMENT in advance of the trade show. RELOCATION OF EXHIBITS: SHOW MANAGEMENT reserves the right to alter the official floor plan, and/or re-assign any Exhibitor’s location as deemed advisable. SHOW MANAGEMENT further reserves the right to make such changes, amendments and additions to these terms and conditions and such further regulations as it considers necessary for the good of the Show. LIMITATION OF EXHIBITS: SHOW MANAGEMENT reserves the right to stop or remove from the Show any Exhibitor, or his representative, performing an act or practice which in the opinion of SHOW MANAGEMENT is objectionable or detracts from the dignity of the Show or is unethical to the business purpose of the Show. SHOW MANAGEMENT reserves the right to refuse admittance of exhibits or materials to the Show until all dues and fees owed are paid in full. No Exhibitor shall hold any social event, hospitality suite, meeting or demonstration to which attendees are invited that are in conflict with the official Show schedule. In addition, ANY such activities may not take place outside the official Show schedule without the express written permission of the Convening Organization(s). MUSIC, AUDIO EFFECTS, PHOTOGRAPHY and VIDEOTAPING: Music and audio-visual devices with sound are permitted only in those locations designated by SHOW MANAGEMENT and at such decibel intensity as not to interfere with the activities of other exhibitors. Photography and video taping other than by official SHOW MANAGEMENT photographers is not permitted within the exhibit hall. Only the exhibitor may grant permission to have its exhibit and/or products photographed. COPYRIGHT LAW: No copyrighted music may be played or sung in the exhibition area in any fashion (including, but not limited to, background music on video or audio presentations) without obtaining appropriate licensing. The exhibitor shall indemnify SHOW MANAGEMENT, the Convening Organization(s) and the facility, their officers, directors, employees, and agents and save them free and harmless from any and all liability whatsoever, for any infringement of or other violation arising out of the use of copyrighted music. SECURITY: Although security service will be furnished, SHOW MANAGEMENT cannot and will not be responsible for damage to, loss and/or theft of property belonging to any exhibitor, its agents, employees, business invitees, visitors or guests. Each exhibitor must carry their own insurance. APPLICABLE LAWS: This contract shall be governed by the laws of the State of New Jersey. Exhibitor agrees to abide by all federal (including but not limited to FDA), state, and city laws, ordinances, and regulations concerning fire safety, health, environment, public safety and hazardous materials and all regulations and restrictions imposed by the Facility. All displays and decorations must be fireproof. § Loss, theft, damage to goods, or injury to himself, his employees, or attendees while in the exhibition area, nor any consequential damage to his business for failure to provide space for the exhibit or for the failure to hold the event as scheduled. The Exhibitor assumes entire responsibility and hereby agrees to protect, indemnify, defend and save harmless all parties from claims, losses, damages to persons or property, governmental charges for fines and attorney’s fees related to the use of the exhibition premises or part thereof. In addition, Exhibitor acknowledges that neither SHOW MANAGEMENT nor the Conventing Organization(s) maintain insurance covering Exhibitor’s property and that it is the sole responsibility of Exhibitor to obtain business interruption and property insurance covering such losses by Exhibitor. § THE ABOVE-CITED REGULATIONS as well as all conditions stated in the Exhibitor Prospectus and exhibit application become a part of the contract between the Exhibitor and the Conventing Organization(s). INSURANCE: All property of the Exhibitor is understood to remain under its custody and control in transit to and from or within confines of the Facility. SHOW MANAGEMENT does not maintain insurance covering Exhibitor’s property. Exhibitor shall carry Comprehensive General Liability coverage including premises, operations and contractual liability coverage of at least $1,000,000 for Personal Injury Liability and $500,000 for Property, Worker’s Compensation with Employer’s Liability with applicable statutory coverage. Certificates shall be furnished upon request. FORCE MAJEURE: In the event the Facility or any part of the exhibit area thereof becomes unavailable, whether for the entire event or a portion of the event, as a result of fire, flood, tempest, inclement weather or other such cause, or as a result of governmental intervention, malicious damage, acts of war, strike, lock-out, labor dispute, riot, or other cause or agency over which SHOW MANAGEMENT has no control or should SHOW MANAGEMENT decide, because of such cause, that it is necessary to cancel, postpone or re-site the exposition or reduce the move-in or installation time, show time or move-out time, SHOW MANAGEMENT shall not be liable to indemnify or reimburse exhibitor in respect to any damages or loss, direct or indirect, arising as a result thereof. TERMINATION OF RIGHT TO EXHIBIT: SHOW MANAGEMENT reserves the right to terminate without notice an exhibitor’s right to exhibit if an exhibitor or any of their representatives fail to observe the conditions of this contract, or in the opinion of SHOW MANAGEMENT, they conduct themselves in an unethical or unprofessional manner. Such exhibitors will be dismissed without refund. ADDENDUM: SHOW MANAGEMENT reserves the right to make changes, amendments, and additions to these rules as considered advisable for the proper conduct of the exposition, with the provision that all exhibitors will be notified of such changes. BOOTH CONSTRUCTION & SHOW SERVICES: Standard booths are limited to 8 foot high background drapes and 3 foot high side drapes. Maximum height of exhibit is 8 feet and may extend only one-half of the booth depth from the back wall. Height in the front half of the exhibit space cannot exceed 4 feet. Booths shall not obstruct other exhibitors or aisles. Booth carpeting (if facility is not carpeted), decorations, furniture, signs and electrical connections are available to the Exhibitor through the Official General Service Contractor, who will bill the Exhibitor directly. SHOW MANAGEMENT is not responsible for any service provided by independent contractors. SHOW MANAGEMENT reserves the right to finish and decorate any unfinished partitions, walls or backs of signs that are exposed to the public and to charge the cost to the Exhibitor. Peninsula Booths are not permitted. BOUNDARIES: All parts of all exhibits must be exhibited within Exhibitor’s assigned space boundaries. Aisle space is under the control of SHOW MANAGEMENT. GENERAL SHOW POLICIES: Noisy or offensive exhibits are prohibited. Distribution of literature or samples must be related to exhibit and distribution limited to within Exhibitor’s space. Canvassing the exhibit hall is strictly prohibited. No food or beverages may be distributed from Exhibitor’s space without the pre-show approval of SHOW MANAGEMENT. The Exhibitor may not display signs that are not professionally prepared or that in the opinion of the Show Manager detracts from the appearance of the Show in any manner whatsoever. SHOW MANAGEMENT shall have sole control over all admission policies at all times. Any conference activity or demonstration planned before, during or after the meeting by vendors (including but not limited to exhibitors, sponsors) that involve conference invitees, meeting attendees, delegates and/or officers must be approved by the AAOP. Generally such activities may not take place without pre-approval to maintain the educational integrity of the conference or meeting. Certain activities, once approved may warrant premium charges. USE OF DISPLAY SPACE: A representative of the exhibiting company must be present at the booth(s) at all times during the posted exhibit hours. With the exception of book publishers, the sale of merchandise or equipment of any kind is prohibited in the exhibit hall. The use of the Convening Organization(s) logo on displays, signs, giveaways, promotional literature or other material is strictly prohibited. In addition, the use of the acronym of the Convening Organization must not be used on pre, at-show and/or post-show promotional material unless specific written permission is granted. Use of any Convener, Sponsor or other logos is strictly prohibited unless permission is granted directly from those organizations in writing. Signs or other articles are prohibited from being fastened to the walls, pillars or electrical fixtures. The use of thumbtacks, tape, nails, screws, bolts or any other tool or material which could mar the floor or walls is prohibited. Drip pans must be used under all equipment where there is a possibility of leakage. No helium filled balloons or adhesive backed stickers may be used or given out by exhibitors. FDA APPROVAL/CLEARANCE: If an exhibitor intends to display, introduce or feature an article whose pre-market approval or clearance is pending from the US Food & Drug Administration, the exhibitor’s materials, and the exhibitor’s personnel must disclose that such article has not received final FDA approval/clearance and clearly conveyed the status of such article consistent with such laws, rules and regulations administrated by the FDA. The exhibit and any associated materials also must adequately and completely disclose that the article is not currently available for sale or commercial distribution in the US. Exhibitors shall indemnify and hold harmless SHOW MANAGEMENT and the Convening Organization(s) from and against any and all costs, fees, expenses, penalties, damages and claims arising from exhibitor’s failure to comply with all laws, rules and regulations (including those of FDA) applicable to such article (including any law, rule or regulation governing the display, introduction, or advertising of such article prior to final FDA approval/clearance). EXHIBIT HALL BADGES: All exhibitor personnel must be registered. Instructions for this process will be provided to exhibitor when confirmation of booth assignment is made. UNION LABOR: Exhibitors are required to observe all union contracts in effect among SHOW MANAGEMENT, official contractors, facilities and various labor organizations represented. Any labor required for installation or dismantle, decoration or use of equipment must be ordered through the general service contractor. Tipping is strictly forbidden for any personnel providing any services.